Select the type of base substrate [structural building element] on which the modular rigid covering is to be installed. In old buildings, for which the climate data at the time of construction are unknown, assume laboratory conditions (about 23 °C and 55% RH). Do you know the active deflection of the deck or slab? Timber decks must, in all cases, be considered unstable base substrates (I), with high expected movements, in the form of active deflections, dimensional changes caused by temperature and damp, and even vibrations. Metal decks can display different degrees of stability as a function of multiple factors: metal structure, type of slab, spans and edges, and stiffness. They must at least be cross-referenced with respect to Basic Document DB SE-A of the Spanish Technical Building Code (CTE), which, in turn, refers back to the Basic Document on Structural Safety DB SE 1 [Section 4.3, on Strength and Stability]. The foregoing documents enable a guideline to be established with regard to stability, based on relative deflection, as defined in the Basic Documents of the CTE. When data on metal deck stability are unavailable, they must be considered unstable (I) for the installation of modular rigid flooring. In old buildings, for which the climate data at the time of construction are unknown, assume laboratory conditions (≤ 23 °C and RH > 70%). Note: If you do not know this, you need to complete the part of the questionnaire on decks or slabs: Concrete beam and pot floor, Concrete waffle slab, or Other type of deck or slab. Does the modular rigid covering design include intermediate layers? The protection layer is to be understood as a layer set between two layers to protect the underlying layer from chemical reactions or attacks from the outside, customarily involving a proofing, either against water or damp or against chemical substances in a liquid or vapour state. Since waterproofing has already been dealt with as an intermediate layer, chemical proofing is dealt with here, with characteristics that provide chemical resistance and assure tightness to the penetration of chemical products and their attack against underlying layers. This intermediate layer is included in specialised modular rigid coverings that usually have other functions, such as mechanical strength. Protection layers are applied in Industrial Architecture, and in commercial and services building areas. Stable, clean and dry base substrates are required, owing to the stiffness of some materials that constitute the chemical proofing or to their incompatibility with damp in certain cases. Moderate instability or instability in the base substrate will require the installation of a floating floor screed that, after maturing, will provide a new rigid, flat, level and stable surface to receive the protection layer and the subsequent modular rigid flooring adhered on top of that layer. They are generally associated with thin-bed tile installation, using reaction resin adhesives that are usually compatible with the protection layer. The most common protection layers are reaction resin-based liquid proofings. Uniform sanding on the fresh damp proofing allows the cementitious adhesives to be anchored. Electric systems with meshed resistances installed on a flat base with a deformable cementitious adhesive, which can, in turn, receive the modular rigid flooring with a minimum screed. Warm water systems with serpentine layouts, requiring thicker screeds, also because they incorporate insulations and a floating floor screed. Which radiant heating system is to be incorporated in the modular rigid flooring? Independently of the existence of other specialised intermediate layers, floors that house installations need to have a filling layer that fills up, protects, and decouples those installations in the base from the modular rigid flooring. For example, French standard NF P61-202 (December 2003) [Modular rigid floorings installed with mortar] lays down the conditions of the layer that is to house the installations and their different variants, a layer that is termed "ravoirage" [self-levelling mortar bed]. A new base always needs to be installed on this pipe- and duct-housing layer for the modular rigid flooring, this base being a floating floor screed decoupled from the base substrate, where the pre-installation filling layer will act as a decoupling layer. Other functional options may also be performed by the pre-installations layer (insulations, waterproofing, or insulations and waterproofing]. Only in the case of insulations will they be installed before the floating floor screed is laid. For further advice, it is recommended that the help be consulted, especially if other functional requirements are envisaged, such as waterproofing or insulations and waterproofing. Acoustic insulation. Only in the case of soundproofing materials with low compressibility can the installation order be reversed in order directly to install the tiles by thin-bed fixing with deformable adhesives on top of the insulation, the floating floor screed remaining underneath. Floating floor screed. When the waterproofing and the drainage are installed using materials with low compressibility, tiles can be directly installed on the floor screed in a thin bed with deformable adhesives, suppressing this second floating floor screed. Waterproofing. Only in the case that a soundproofing with low compressibility and a waterproofing, also with low compressibility, should coincide can the following floating floor screed be avoided, the flooring being installed directly on the waterproofing drainage using deformable adhesives applied in a thin bed or an intermediate bed. Decoupling serves to debond the base substrate from the intermediate layers and/or the modular rigid covering, the bond being understood as a mechanical and/or chemical anchoring that prevents the free movement of both parts. Decoupling layers usually consist of a bed of sand, gravel, cement-poor mortar (stabilised sand), polyethylene film, geotextile or other thin synthetic material, and do not constitute stability-contributing factors. This is understood as a material that is inserted to prevent contact between two layers, customarily between the surface of the base substrate and the intermediate layers or the bonding material of the modular rigid covering. The material may range from a primer, i.e. a liquid proofing applied on to the base substrate, or a film or mat anchored to the base substrate (when the film is not anchored, it must be considered a decoupling layer, and one needs to select an option with the decoupling layer in order to complete the questionnaire correctly). The separating layer prevents any chemical reaction between different materials. Owing to its thinness, it does not contribute to instability. The construction solution of insulated and waterproofed modular rigid flooring, customarily associated with roofs, and floors in water-related domains, is one of the most complex, owing to the number of specialised layers, the order of arrangement, and the junctures with other abutting building elements or drains and ducts. In very harsh climates, vapour barriers must also be included to prevent condensations behind roofs, including drainage systems that lead condensed water to drains. Only in the case of a soundproofing and waterproofing plus drainage of sheet membranes or a prefabricated waterproofing, both with low compressibility, can they be compatible with a direct tile installation using deformable adhesives applied in a thin bed or an intermediate bed on the drainage. In other cases, the insulations and the waterproofing are always installed with a load distribution layer that will act as a floating floor screed on which the tiles are subsequently installed. What type of insulation do you wish to incorporate? If thermal and also acoustic insulation is needed, using specialised and not multi-use materials, only the compressibility of the thermal insulation is taken into consideration, it being assumed that the soundproofing material is of equal or smaller compressibility. The compressibility of the thermal insulation leads necessarily to the incorporation of a compression layer, which will act as a floating floor screed on the insulations, and the magnitude of that compressibility will help in the design of that layer (thickness, mortar composition and, where appropriate, arrangement of an electrowelded lath in the middle). Modular rigid covering system initially consisting of a waterproofing layer, with or without drainage, and the tiling itself, unless the compressibility of the materials in that layer make it necessary to incorporate a load distribution layer as a new tiling substrate on the waterproofing and, where appropriate, on the drainage. What type of waterproofing are you going to use? Liquid waterproofing, according to the definition in standard EN 14891 (2007), appropriate for internal or external modular rigid coverings directly adhered on to the waterproofing, though there is also the option of incorporating a drainage that is compatible with the tile installation without there being a compressible layer. Liquid waterproofing requires stable, flat and levelled or plumb substrates that are appropriate for thin-bed tile fixing, without cracks. By means of sheet membranes and a drainage layer, a load distribution layer always being incorporated that acts as a floating floor screed on that waterproofing and drainage, and that constitutes the substrate on which the tiles are to be installed. By means of prefabricated systems that enable direct tile installation on the waterproofing and drainage, the prefabricated system that constitutes the drainage (usually profiled polyethylene sheets) being assumed to have low compressibility. Is the liquid waterproofing to include drainage? Levelling layer (extending to slope-providing layers). The load distribution layer has the specific function of assuring the stability and durability of the modular rigid flooring, in regard to mechanical strength, in relation to the dead and live loads that it will be subject to in its useful life. Load distribution layers have the same treatment in regard to stability as levelling floor screeds and floating floor screeds installed with cement and/or lime mortar: that is, for thickness below 80 mm they are evaluated in terms of age and environmental conditions with regard to maturity, surface moisture content also being controlled in certain situations. If thermal and also acoustic insulation is needed, using specialised and not multi-use materials, only the compressibility of the thermal insulation is taken into consideration, it being assumed that the soundproofing material is of equal or smaller compressibility. Is the compatibility of the adhesive with the surface of the insulation material assured? Liquid waterproofing has come to prevail on vertical substrates because of its ease and rapid application. That choice requires the surfaces on which this is applied to be stable and without cracks and, in swimming pools, it also being taken into account that there cannot be excessive vapour pressure from underlying layers (for example, great humidity from the ground). The cross-linkage reached by this type of material does not allow it to withstand tensile stresses beyond a certain limit. As a result, when faced with crack risk, one should choose sheet waterproofing. Does the base substrate display cracks wider than 0.75 mm? Does the vertical substrate display plumb and flatness conditions compatible with a thin-bed adhesive tile installation? This is an entirely exceptional construction solution. Waterproofing in claddings is particularly required in damp or permanently wet environments, swimming pools and, exceptionally, in external claddings. The insulations are usually located behind the building envelopes and facings, the waterproofing thus being installed on an external building element (building envelope or partition wall). This arrangement is common even in special applications, such as cold stores. The base substrate must have the conditions of plumb and flatness that, after the installation of the different layers (insulations and waterproofing), provide a suitable surface for thin-bed or intermediate-bed adhesive tile fixing. Otherwise, it will be necessary to regularise the base substrate surface by means of a rodded parge coat, on which the insulations are installed first, and then the waterproofing. The (acoustic and/or thermal) insulation materials shall have medium or low compressibility, with a view to providing the fixing surface with sufficient stability. The waterproofing shall consist of sheet membranes, compatible with the nature of the adhesive. Under these premises, direct adhered modular rigid cladding can be laid in a thin bed or an intermediate bed using deformable adhesives. On an unstable vertical substrate, the decoupling requirement entails a new stable base for the modular rigid cladding, termed a self-bearing parge coat, i.e. a rigid layer mechanically anchored to the base substrate, which involves the arrangement of an electrowelded lath in the middle of that layer. The consideration of this intermediate layer is associated with the instability of the vertical substrate, which does not assure the durability of a base-bonded adhered tile installation. The following act as decoupling layers in vertical substrates: insulation sheets and panels (usually of high density and low compressibility), anchored to the vertical substrate; and protection or waterproofing membranes or sheeting, customarily adhered to the substrate with a deformable adhesive. The regularising layer may be an unrodded or rodded parge coat, installed in one or more (up to three) layers, as a function of the necessary surface thickness and handover requirements. The stability of the cement conglomerate is considered, independently of its thickness (up to 25 mm), of the number of installed layers, and of the inclusion or not of a reinforcing lath. This stability depends on the degree of maturity of the applied mortar. The protection layer is to be understood as a layer set between two layers to protect the underlying layer from chemical reactions or attacks from the outside, customarily involving proofing, either against water or damp or against chemical substances in a liquid or vapour state. Since waterproofing has already been dealt with as an intermediate layer, chemical proofing is dealt with here, with characteristics that provide chemical resistance and assure tightness to the penetration and attack by chemical products against underlying layers. This intermediate layer is included in specialised modular rigid coverings. Protection layers are applied in Industrial Architecture, and in commercial and services building areas. Stable, clean and dry base substrates are required, owing to the stiffness of some materials that constitute the chemical proofing or to their incompatibility with damp in certain cases. Moderate instability or instability in the base substrate will require the installation of a self-bearing regularising layer that, after maturing, will provide a new rigid, flat, level and stable surface to receive the protection layer and the subsequent modular rigid cladding adhered on top of that layer. They are generally associated with thin-bed tile installation, using reaction resin adhesives that are compatible with the protection layer. The most common protection layers are reaction resin-based liquid proofings. Uniform sanding on the fresh damp proofing enables the cementitious adhesives to be anchored when tile installation with reaction resin adhesives is not required. Was the service start-up programme of the heating carried out before the modular rigid flooring was installed? The response "The same as the base substrate" indicates that a base-bonded system is involved with regard to the relationship between the intermediate layers and the base substrate or underlying structural element, the stability or instability of that element being transferred to those layers. 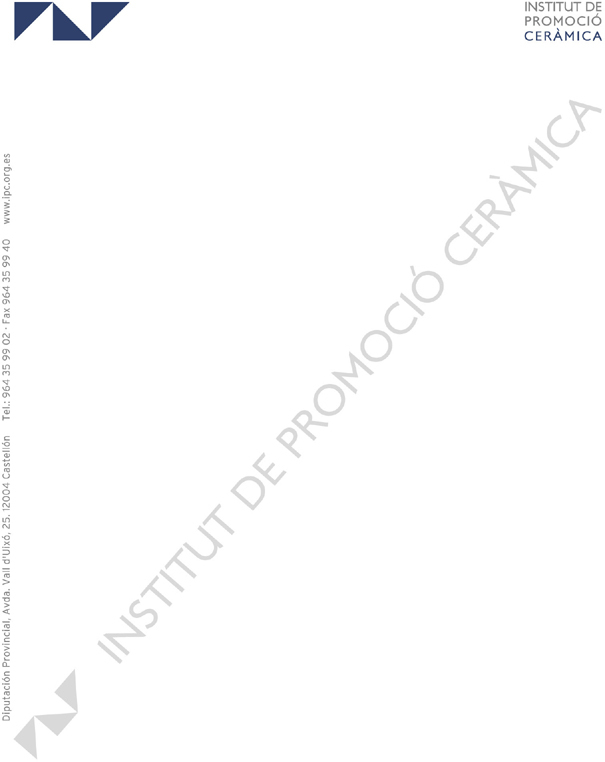 The response "They are considered to be moderately unstable" indicates that the type of intermediate layer constrains the selection of the tile installation technique to a thin bed or intermediate bed with adhesives, also making a certain adhesive deformability advisable, though this is not essential in given cases (liquid waterproofing). The response "Unstable" indicates that, even though a system decoupled from the base substrate is involved, the intermediate layers are not self-bearing and base substrate instability, owing to active deflections in the decks or slabs, is transferred to those intermediate layers. Specify the fixing surface characteristics. An adhered tile installation requires knowing a series of characteristics that constrain the selection of the bonding material and the tile installation technique, independently of the stability of the base substrate or the intermediate layers and the environmental conditions, both at the time the modular rigid covering was installed and throughout its useful life. In addition, the fixing surface must be dry [surface moisture content below 1%] and free of any disaggregated or foreign materials. Is the fixing surface material anhydrite (hydrated calcium sulphate)? Anhydrite has been widely used as a material in constructing levelling floor screeds, given its ease of application and its reduced maturing time, yielding resistant surfaces with optimum conditions of flatness and level. Some countries have technical documents and reference standards for its technological contextualisation and application conditions. Its use in floating floor screeds is particularly noteworthy, with a levelling layer function in order directly to receive a modular rigid covering. Its use is restricted to internal building areas not exposed to the action of water and damp. In the case of rising damp from underlying layers, a primer is usually applied to protect the layer. A primer is also applied on to the outer surface of the anhydrite screed when there is any risk of water or damp penetrating from the flooring. For example, Specification Cahier 3578 (2006) of the French CSTB limits the use of anhydrite to internal building areas with low exposure to water and damp and with moderate traffic, taking the U4P3E2C2 classification (coding according to UPEC) as a reference. Chemical compatibility of the adherends with the bonding material. High: Without any disaggregation, cracks, or spalling. Uniform sound and scratch resistant. Medium: Not scratch resistant, disaggregated surface without cracks or spalling. Uniform sound. Low: Hollow sound, cracks, spalling. Requires repair.